Whats all this about? 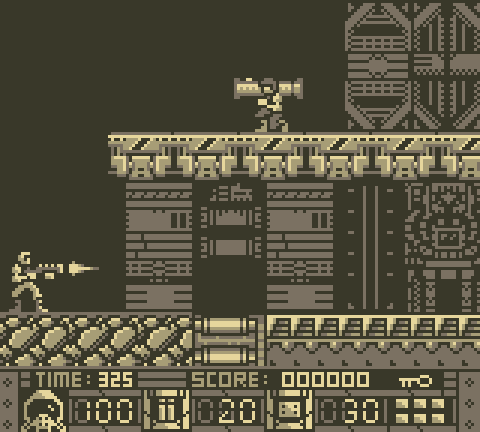 Originally made for Gamejolt's Game Boy Jam 2014 Cryoborg was a platform game made together with @vikingrad for the gbjam held between 1 - 10 August 2014. Take control of the Cryoborg, a military grade cybernetic organism sent on a mission to destroy a top secret enemy research facility nested in the heart of an hostile planet. 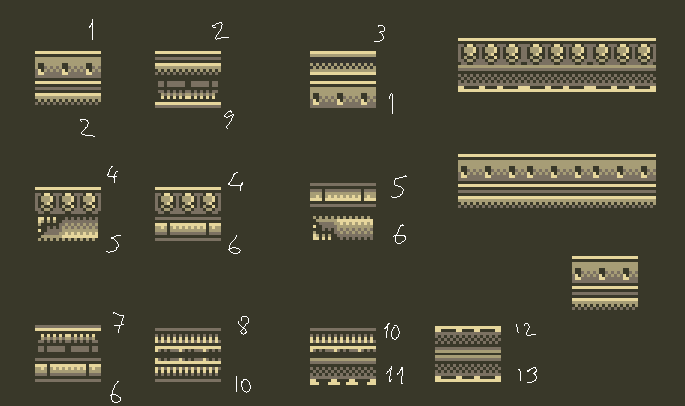 Note that this game was made for the GBjam 2014 that took place between the 1st and the 10th of August, meaning we had very limited time to work on it. 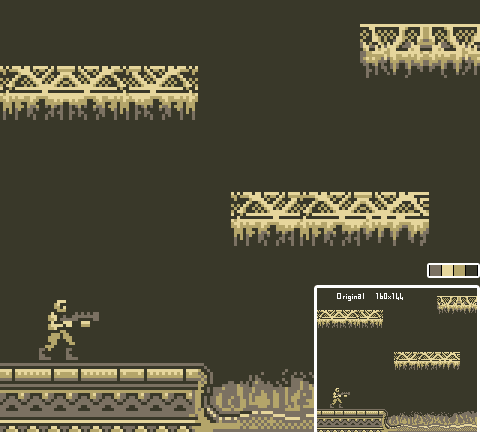 The finished Gbjam version is in a very early state. Many of the stuff had to be left out due to time constrains and various limitations. The good news is we plan to work on a post Jam version that will include many more enemies, weapons, areas to explore and new objectives... I will be updating this page as more and more things get implemented. Not much to say, 160x144 with 4 colours is very limiting but incredibly fun. Its easy to get lost while trying to fill the game screen with details trying to use each colour everywhere so I usually use one colour for the background and one colour for the borders, keeping the background decorations to a minimum. Empty backgrounds dont bother me at all, infact it gives a nice "speccy" feel to games. A screenshot to give a general feel for the game. Initially the UI was going to be numerical but we decided not to use numerical health as a health bar was found to be more easier to read during play. Armour was also removed since we decided it felt pointless to have one in such sort of a game. 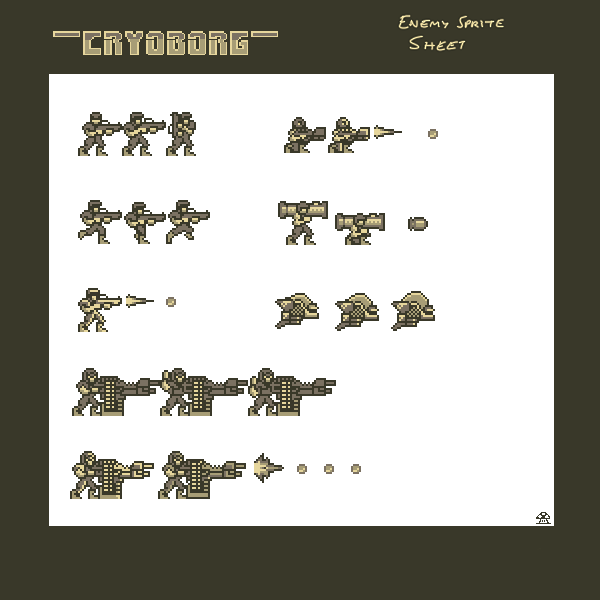 Enemy sprites. I wanted them to be humans or at least humanoid aliens that use guns and maybe slightly alien visors and helmets and of course you cant have a platform game without floating / flying enemies so added the drone. Stuff below were intended to be added to the game but were left out due to time restrains or various other reasons. There wasnt much story involved but there are scenes where pieces of the story are given via a commanding officer's monologues through a communicator device. As we had to drop various things out we had to simply the story (unfortunately to a non existent state) too. Bombs couldnt make it to the jam release so the story was changed. The original story was to involve placing bombs into various spots and rescuing an AI sort of holographic interface. Look alive tin man... In a few minutes you will touch down on enemy territory with only a couple of minutes to complete the mission. Our spies have marked six critical locations near your drop zone but due to disturbance in our communications we were not able to pinpoint their exact locations. Fortunately the eggheads in the science department installed a new type of short range sensor within you and with the help of this device, the target locations will be marked on your HUD once you get near them. Cut through the enemy lines as quickly as possible, find these six locations and drop your payload. Your mission will be complete once you manage to set the last bomb. I suggest you to find spot with a view and enjoy the fireworks once you complete the mission as there will be no extraction attempts for you. You are considered as a simple tool and the manufacturing department will be able to produce more copies of your sad metallic hull no matter what happens. It saddens me deeply but such will be the lifespan of a tool. Later on the Cryoborg was going to learn about the AI, and revolt against his masters etc so once we update the game to post jam status there will be a much better story. Originally the player was to collect coins scattered around the level to spend in some type of shop to upgrade various abilities and weapons but this feature was dropped due to time constrains for the jam's deadline. Why would you have a shop in the middle of the enemy territory and why would they want to sell stuff to you and even if they want to why pay them when you can take the items and shoot the enemy shopkeeper instead :) So instead of a shops it may be better to call them upgrade consoles where the player collects money (ok hold on, why would you want to have coins scattered in an enemy base like the Nazi excavation sites from Indiana Jones flicks?) hmmm, maybe the player can collect various data discs that are required to activate the upgrade panels in the consoles and these consoles can be used to upgrade different aspects such as movement or fire speed, weapon damage, max ammo capacity, max time, smart bombs etc. The player was to explore the map and set 6 bombs to locations scattered across the map and leg it out before. The map tiles where divided into two parts. Ground tiles and backgrounds patterns. Ground tiles were planned to be made of two different tiles joint together for a greater range of possibilities. If I recall correctly there were around 20 or so ground tiles made but Im not sure how many were used. Backgrounds were two types, distant and close. Distant was stuff like factories, domes and structures or whatever you call them while the close ones were more like walls and doors and stuff. 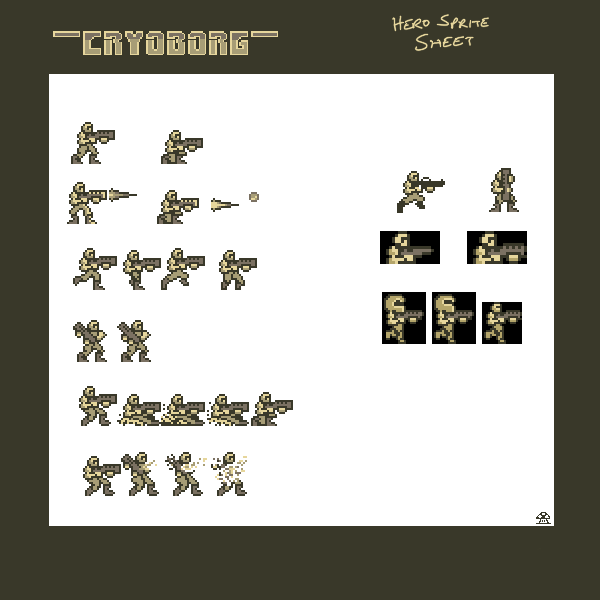 there were also couple of different "cover tiles" for the player to take cover behind them and avoid enemy fire. Thats about it for now but will update this page as new things get implemented.